Clarence Nelson was a Memphis guitarist who worked in several city bands in the 60s like the house band at Johnnie Currie's Club Tropicana. No doubt he also played on R & B recording sessions as well, and he was a member of the Fieldstones on High Water in the 80s. but he only seems to have made two 45s under his own name. The famous Memphis engineer Stan Kesler, whose work for Goldwax and other southern soul labels like XL is rightly revered, apparently owned the Pen label (although XL’s Gene Lucchesi may also have been involved) but this is the only 45 on it that I could recommend. 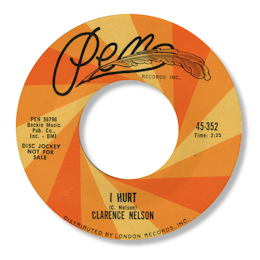 I Hurt is a simple piece of country soul, just a rhythm section, no horns, but Clarence Nelson’s vocal turns it into a memorable one. Although his range isn’t too great he uses a lovely gritty tone which makes the fine melody work very well.